aromatic amines and Michael acceptors are not all created equal. Only electron rich anilines are a problem (N-hydroxylation, quinone formation), electron deficient anilines, especially when substituted in para position are pretty innocuous - as various aminopyridines and aminopyrimidines attest. p-aminosalicylic acid was used as a tuberculostatic drug in doses in excess of 15 grams daily. Acrylates are bad but cinnamic acids, their amides etc are too lazy to act as a good Michael acceptor. 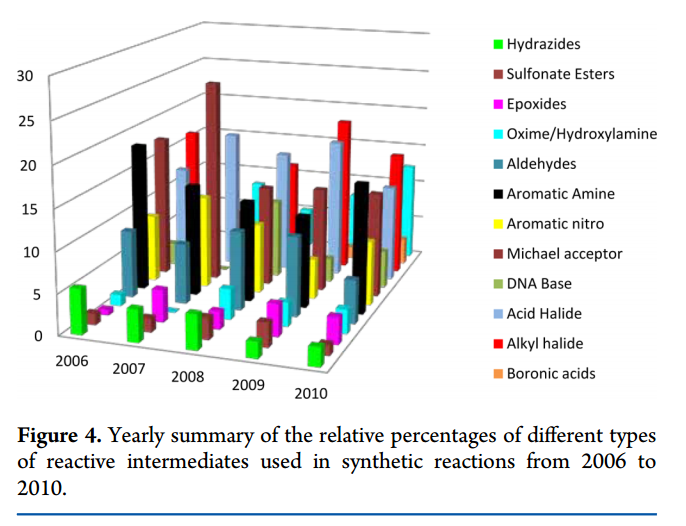 There are sound reasons for avoiding nitro groups but there is a whole slew of old drugs (and even one new one) that have nitroaromatic part and they are safe. I've noticed that, at the scales usually used in academia, that the boron reagents used to prepare the boronic acid starting materials are usually rather pricey. By what factor does their price decrease, when used commercially? I've historically worked a couple of programs which use Suzuki couplings in key parts, although I've seen some process chemists try to stick those earlier in the synthesis (pre-GMP steps) in order to keep the residual Pd low throughout the GMP steps - scavenging resins aren't cheap. Additionally, I've anecdotally found that we can lower our catalyst charge if we're earlier in the synthesis, and with Pd(II) being the price it is that can make a difference in overall manufacturing costs. 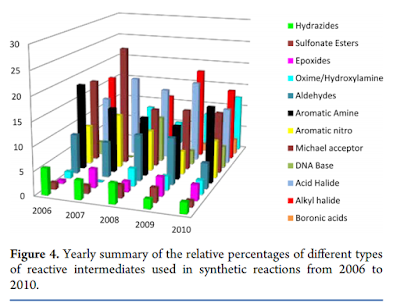 There is also a report in OPRD discussing the mutagenicity of boronic acids, which may be a bit worrying for everyone? Good point - I know that boronic acids usually are hits in DEREK/Leadscope/SARAH software, and that it's been an expectation that any specific boron-containing compound we're using in GMP routes gets eventually put through an Ames or other tox test. Interesting to see an aminoglycoside as the only one without reactive intermediates. Those antibiotics are a synthetic nightmare with 7-10 polar groups and 12-18 chiral centres each. Though the production of netilmicin is just the addition of an ethyl group to sisomicin, which might be why the reaction is comparatively mild. More complex aminoglycoside synthesis are still almost a no-go, we're limited to biological production or modification of biological ones.